One thing I am always nervous about is storing sensitive data on my MacBook Pro. Over the past few years it seems like there are stories popping up in the news about some organization loosing sensitive customer data when a laptop is misplaced. As someone who makes a conscious effort to have only one computer, I am concerned about storing my banking and tax information on a portable computer. Storage device must be removable. Data access should only be permitted once a suitable password has been entered. Password must be required to access data after MacBook Pro comes out of sleep mode. To meet my goals I am using a piece of software called Knox in conjunction with an ExpressCard/34 solid-state disk. 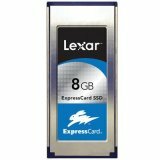 I am currently using a Lexar ExpressCard/34 SSD with an 8GB capacity since that is what the local computer store had available at the time, about six months ago. Today it is possible to get a 32GB card from TRANSCEND, so the capacity is ever increasing! The card I store my sensitive data on is the Lexar 8GB ExpressCard SSD. It fits in the ExpressCard/34 slot on the left side of my MacBook Pro and is makes for a very convenient place to store all of my Quicken and TurboTax data files. Using Knox I setup the entire Lexar card as an encrypted filesystem.